URUGUAY – After being washed ashore, evidently injured by a fishing net, a baby dolphin approximately 10 days old is nursed back to health. The young La Plata river dolphin was discovered by walkers on a beach near the Uruguayan capital of Montevideo; there was no sign of a mother nearby. 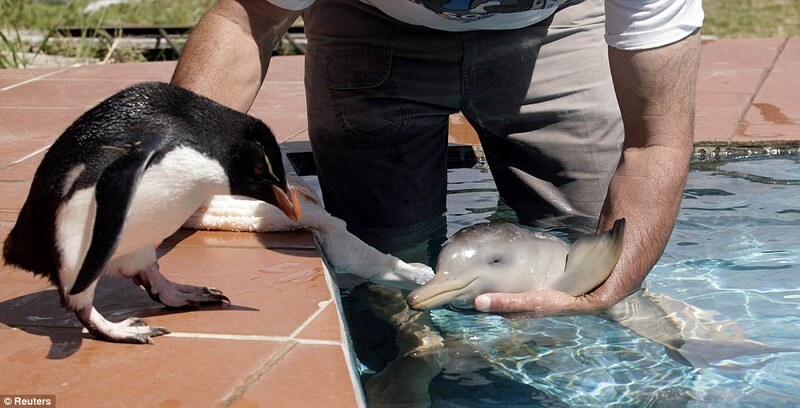 See the magnificent photos of the tiny dolphin now named Nipper – and the concerned penguin who oversaw his care. 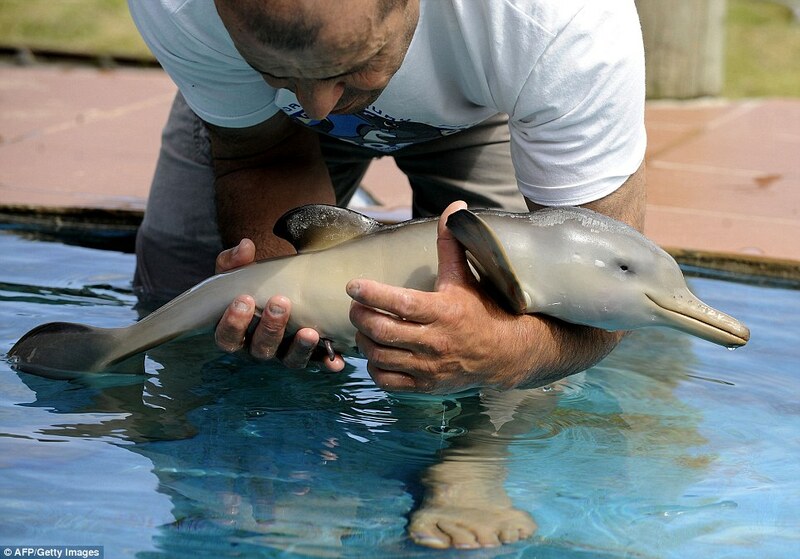 Richard Tesore, head of the NGO Rescate Fauna Marina, feeds a baby La Plata river dolphin in Piriapolis, 100 km (62 miles) east of Montevideo. 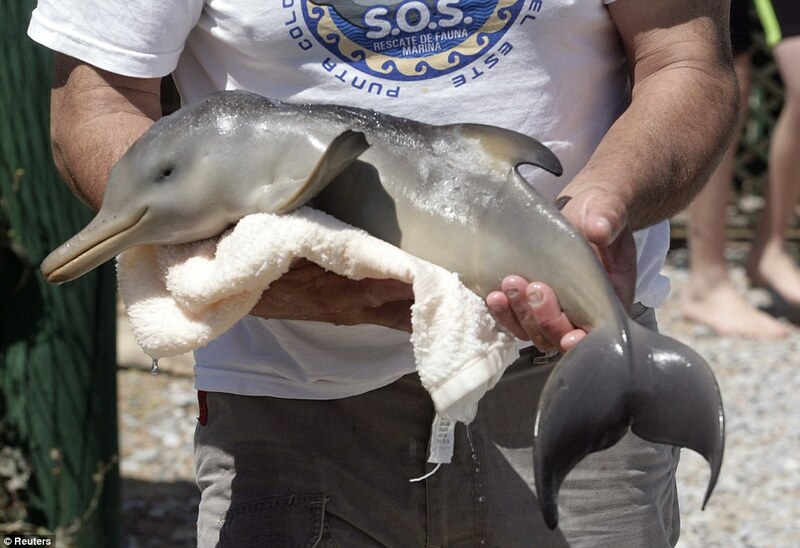 The SOS marine animal rescue centre in Piriapolis, on the coast of Uruguay is trying to save baby Franciscan dolphins orphaned by the nets – but it is a losing battle. At least 1500 adult dolphins are caught in gill nets each year along the 4000km of coastline that links Brazil, Uruguay and Argentina. But scientists say the toll could be much higher. Dr Ricardo Bastida, a marine mammal scientist at Argentina’s University of Mar del Plata, says research on the Franciscan dolphin, also known as the La Plata River dolphin, is almost non-existent and the total population unknown. It is on the international Red List of threatened species as being of concern due to gill nets, over-fishing and pollution.Scientists from Brazil, Uruguay and Argentina are cooperating to try to find ways to save the dolphins along their coasts. One of the biggest problems is that dolphins are competing with humans for food. “The fishers are poor people, so it’s very difficult. It’s not just a commercial fishery but also a traditional fishery and the fishermen have to feed their families or they die,” Dr Bastida says. Fishers are being encouraged to attach pingers to their nets, but many are reluctant. Although the sound keeps dolphins away, it attracts sea lions, which eat the fish and destroy the nets. “Dozens of baby dolphins are caught, but it is almost impossible to rehabilitate them because they are usually in very poor health,” Dr Bastida says. The SOS marine animal rescue centre was established in 1993 and is one of the first of its kind in South America. Hand-rearing baby dolphins is one of the few ways conservationists can fight the toll from gill-net fishing. The Franciscan dolphin belongs to a family which includes freshwater species found in the Amazon River and in river deltas in India and China.